This is the room where we spend most of our time. The room is not completely done yet, we are still toying with getting a sleeper sofa. As we walk in to the right we have the gorgeous built in. This houses several bits of collecting I have. Heisey glass, Nativity globes and cherished teddies to name 3. The bottom left holds our games and the end cabinet on the bottom holds toys for the children who come to visit. The dining table, or as we call it game table, was MJ’s grandmother’s then it went to his mother, now it is ours. The roll top desk was something he picked out of the estate. We decided to make this the family wall. Here we also set up the old clock fil had. We sent off for the key and now it chimes the hours for us! Then there is my favorite piece. The curio cabinet. It is full of things from grandmothers Hummel plate and bell to fil’s indian pots. There are the salt and peppers I kept from the last culling, I think about 150 sets… not sure anymore! Plus my nativity sets. I inherited several sets from fil. My favorite set though is the one on top, the Jim Shore set my beloved got me for Christmas last year. It never left its box until I put it in this cabinet. Then the TV area. We are keeping with our old theme of indian motif. The 2 large prints mil and fil gave us when they down sized their home. The smaller one is a photo of a Souix chief, the gentleman above him is the photographer that took the picture. There is also the indian rug. We have no information on it. We just know it has always gone with the indian prints and so we keep it with them. The wood and iron shelf holds pewter figures of horses, indians and 1 lost cowboy! Then there is the back door. To the left is a huge closet, filled right now with empty totes. To the right we have the guys bathroom. The center piece of the area though, besides the tv, is this table. In fil’s home it housed his collection of pocket watches, in ours, my Beloved’s collection of old calculators and hand held computers, including a Raspberry Pie! Last post I showed you the porch in front of the dining room. Today we head on into the dining room. Looking to the left is a 1950’s era table that we use as a buffet. When not needed to hold serving dishes it holds various knick-knacks and the mail box. Along the window wall will have paintings done by my mother in law. They are not up yet in these pictures. We have 3 pictures and 2 frames, we are currently looking for 3 rustic matching frames. I will explain her story behind the pictures in a different post. The table in the center is one we bought and love. We have had it for years and finally found chairs to match it. The original chairs were cheap and fell apart quickly. These chairs are sturdy and comfortable! Then we come to the real focal point of the room. The enormous and gorgeous built in china cabinet. Top shelf Currier and Ives Blue by Royal. My mother had a large set of this and some day I will too! It brings back happy memories for me. Under that is a set of Mikasa Early Spring that belonged to my Beloved’s maternal grandmother. Some pieces have been broken over the years. Once I am totally settled, they will be replaced! 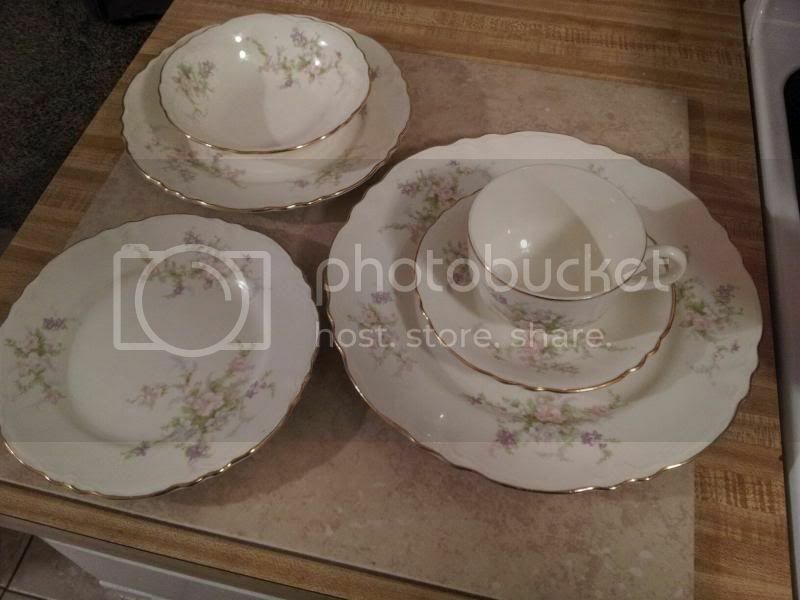 Next is a set of Royal Dalton “Blueberry” dishes. My mother in law collected these at a grocery store here. She added some dark blue things to it to make an attractive table setting. She was an artist and having things just so was part of her nature. Next we come to Grandmother’s Milk Glass. This is mingled with some of my own pieces but the majority was procured at the estate sale by a friend of mine, for me. Grace was a wonderful lady who totally lived her name. It is an honor to me to house her milk glass collection. The shelf below that contains a set of antique Homer Laughlin china. There is no name other than Homer Laughlin on it… I plan to search it out. I thought I had once before but I can’t find it now. 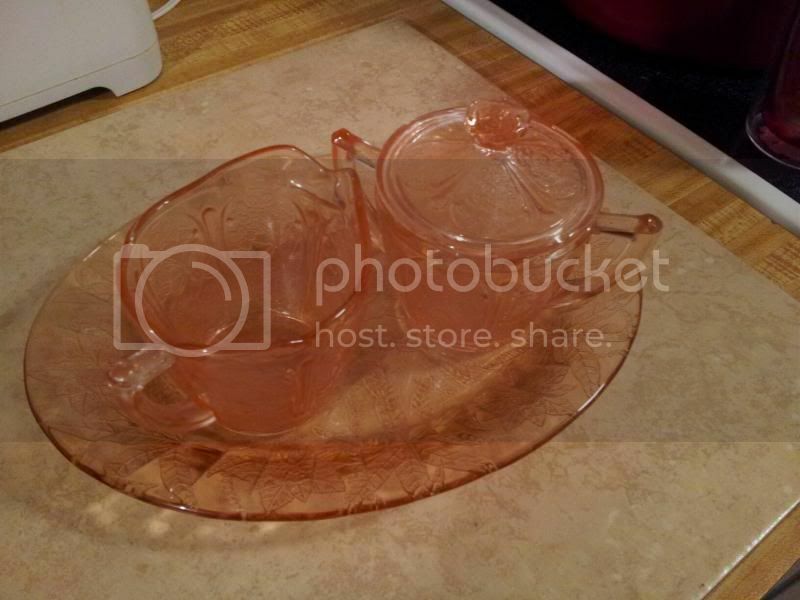 Also with that is a sugar and creamer set and a set of candle sticks in pink depression glass. That is the tour of my dining room. Next time we will go through this door to the kitchen… That one is taking a while! Well today before I take you into the house I decided I should show you my favorite spot outside the house. This is the little porch we use as the front entrance. This leads into the dining room. It is cool and shaded in the morning and then again about 130pm it regains it’s place as a cool shady spot to sit and rest. I sat out here today reflecting on what a lovely spot it is. The trees were swaying in a cool spring breeze. Birds were singing and swooping from tree to tree. A pair of small geckos were scampering about playing chase. Geckos are great friends here in Texas as they eat those nasty big bugs folks call water bugs. We fight those bugs here in true battle. Geckos help win the war. Well here are pictures of my favorite spot in the front of the house. I have no idea why they are sideways. They are not on my pc that way! That said in the last 6 weeks or so we have found, bought and moved into a new home. I am still in the process of unpacking though the end is nearer than I had hoped by this point! I think I will do pictures of each room in single posts. The closest room to done is the dining room. I should finish it by weeks end. I love this house. There are trees here! Plus to welcome us home God sent 3 days of thunderstorms! We have room here to entertain. We have the 2 bathrooms I have wanted for ages! Plus 3 rooms that serve as bed rooms and office. We have a formal dining room, walk through kitchen and a living room/ game room. Plus Katie has a fully fenced yard to run in. She is definitely loving that. Plus she is finding all kinds of bones buried by puppies past. I do think she misses the company she used to get at the old place, with the loose dogs that roamed there. My office is still in a bit if disarray. I am also searching for a small wooden dining table to be used as a cutting/sewing table. I am investing in white wooden bookshelves from Target and loving filing them up. I have 2 so far and need probably 3 more to fit all my books and toys. I am anxious to get back to my sewing! This house has storage everywhere! Even above the tubs! Well here are some pictures to introduce my new homestead. Munchie found a comfy seat in my chair. Mouse was the first to make herself at home in the new living room. Monchie’s favorite spot is in front of my storm door watching the world go by. If my door is not open, she manages to be content in the dining room picture window. A gift from the storms. The front of my new home. I am finally in my dream white bungalow!